Onions pulled. Half of them brought in under cover. Some talk of rain tomorrow morning, but I'll chance the other half. marlin vs wrote: Nice crop, well done. Better than my maincrop. Need rain mumble mumble mumble need rain please. Got the other half in this morning before the rain. Beds now ready to plant out winter cabbages, Brussells Sprouts and Kale. The Runner beans are gone mad! I can't keep up - going to start salting them tomorrow. My onions look more like spring onions rather than normal ones. Lack of rain is my problem I guess, had a shower today but its to little to late to save them for this year. Fingers crossed for next years. Could I plant some in the polytunnel later this year for an early crop next year? You can get autumn sets which you plant around the end of August/ September. They overwinter and grow away in the Spring. You harvest them around the end of May. Never tried them myself. I do this every year, and Garlic too. 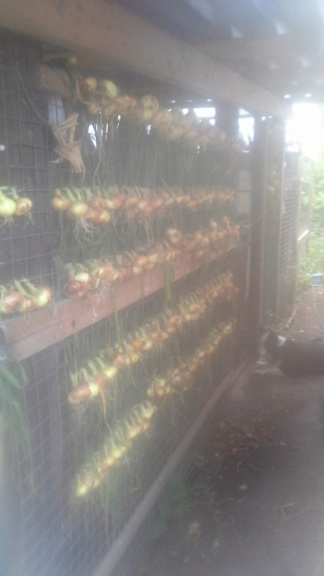 These overwintering onions do not keep as well as the maincrop do, but they come in when my stored maincrop have just about given up. My main crop onions are about half the size they should be. So I will be relying on the overwintering crop. They were known as Japanese onions and a few still carry Jap names but the dutch produce good varieties also.